This DVD is designed to teach the basics of bluegrass banjo playing to the beginning student who has no previous music experience. 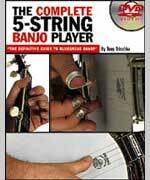 It includes a broad discussion of Scruggs; style banjo playing with a brief introduction to melodic-style playing. Download now from PlayBetterBluegrass.com!